Endlessly versatile, incredibly comfortable and flattering on every figure, the fit-and-flare is the dress we’re living in this spring. With a fitted upper body that nips in at the waist and then lets loose, the fit-and-flare dress looks just as good with pockets as without, comes in every sleeve type and length imaginable and can be worn everywhere, for every occasion. 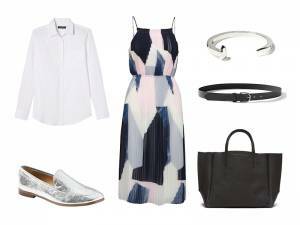 Our women’s style guru, Lexi Clayburn, shares her favorite ways to wear our fit-and-flare dresses this spring. 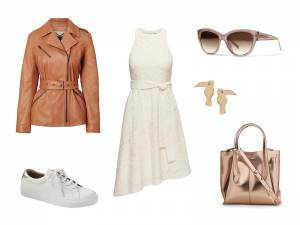 A leather jacket gives a fresh edge to this feminine shape. all the errands and go against the current at the same time. loafers for an outfit that beats the boardroom stalwarts. block-heel sandals and some serious sparklers and go wherever the night takes you. Wherever you’re going this spring, the fit-and-flare is sure to be a perfect fit. Find the fit-and-flare for you.